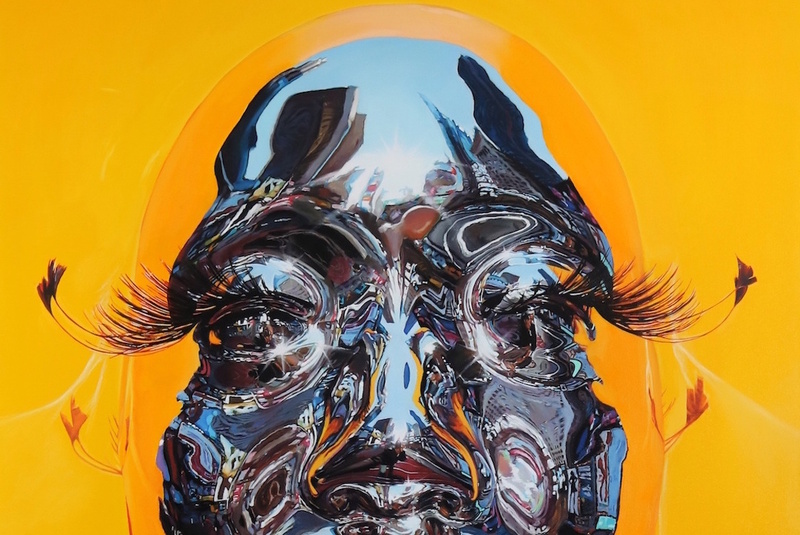 Having come of age in NYC during the formative years of hip-hop in the 80s, even attending the same alternative arts high school Jean-Michel Basquiat graduated from years prior, mixed media artist Kip Omolade’s Diovadiova Chrome paintings and masks are truly something special to behold. They appear to seamlessly blend traditional portraiture and sculpture with Afrofuturism’s cultural aesthetic of combining science fiction, magical realism and African history. Born in Harlem, NY Kip Omolade began his art career as a graffiti artist while interning at Marvel Comics and The Center for African Art. He continued his studies at The Art Students League of New York and earned a BFA at the School of Visual Arts. His work is available directly or through Opera Gallery Hong Kong and Opera Gallery Singapore. And one of Omolade’s paintings from the series, which took five arduous months to complete, is featured on the album cover of Fantasia’s forthcoming release “Definition of…Fantasia.” Other works prominently showcase the facial features of Brooklyn’s DJ Kitty Cash. Why Aren’t There More African-American Boys In Gifted Classes?